Any gasoline-powered engine can be converted to run on Electronic Fuel Injection or EFI. An engine has no idea how it is being fueled. As long as the proper air/fuel ratios and ignition timing requirements are available, the engine will run and in most cases the same engine will perform better and be more efficient when converted to EFI. The advantages are numerous. Great cold start, better fuel economy, better performance as well as altitude compensation. For this reason, it has become increasingly popular to convert the older work horse engines from the past to Electronic Fuel Injection. Ford's 427, 428 and Cleveland engines, Chrysler's 440 and Hemi head engines and of course the Chevrolet small blocks and big blocks are among the popular engines to convert over to EFI. With an Electronic Fuel Injection system, an Engine Control Unit or ECU controls the A/F ratios and ignition timing curves. All aspects of engine performance: cold start, idle speed control, transient fueling, A/F ratios, timing curves and electronic spark control are calibrated into the system and precisely controlled through a feed back process. On a properly calibrated feed back system, the ECU constantly gathers information from various sensors processes it and then tunes and adjusts the engine to meet changing conditions. Another advantage of EFI is the Engine Control Unit can control non-engine functions such as cooling fan operation and transmission functions. When converting a carbureted engine to EFI, there are certain aspects of the engine that need to be addressed in order for the system to work properly. Camshaft profiles that work well with a carbureted engine, may not work as well with the EFI system. This is because of the difference in intake manifold design between a carburetor manifold and some EFI manifolds. A common EFI conversion is to take the components from the Chevrolet Tuned Port Injection equipped Corvettes and Camaros and put them on older small block Chevrolet engines that were previously carbureted. Unless the camshaft is changed to match the Tuned Port intake, the result is not always favorable. In order to realize gains in performance, efficiency and drivability, it is important to make sure when using a particular EFI system that the camshaft match that particular system. The same theory holds true when developing an EFI intake manifold for an engine that was never available from the factory with fuel injection. If the conversion involves converting an existing carburetor intake manifold over to EFI then a camshaft change may not be needed. If a dramatically different intake manifold design is to be used, a cam change becomes necessary. Careful planning from the beginning of the conversion is necessary in achieving a successful out come. 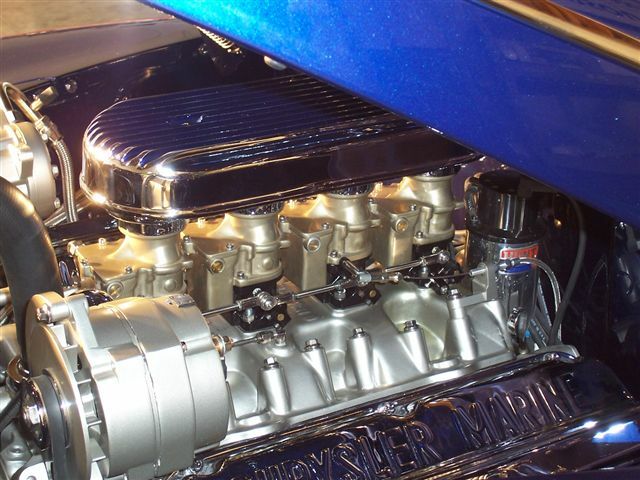 Whether the engine is in a Streetrod, muscle car, truck, boat or designed to work in a stationary piece of equipment, a system can be developed to optimize that engine's performance. Please contact us for more information and with details of your specific project.